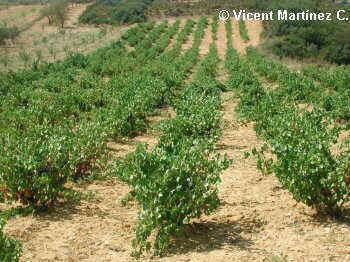 Vine or common grape vine (Vitis vinifera) is a plant native to Asia Minor and the Caucasus, naturalized in the Mediterranean region and North Africa. 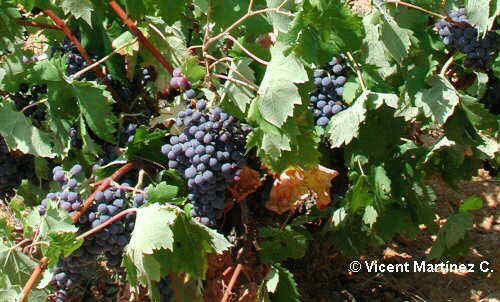 – The Vitis genus comprises about 65 species of deciduous shrubs or vines, creeping or trailing, from Vitaceae family. – The branches have nodes with buds where leaves and new fruits sprout each year. – As a vine gets older, branches will become lignified, acquiring a brownish tone with a crust that melts into strips. In some species, they can reach 30m. long. – It generally has deep roots, but this may vary according to species. – It has alternate leaves, toothed, palmately, most of them heart-shaped, divided into 3-7 lobes. In autumn, before falling, the leaves turn a yellowish color. – Tendrils can appear in place of the leaves. They allow the plant to climb, or crawl on the ground if not supported. – The inflorescence is a raceme or cluster in which flowers are arranged. The clusters can be conical, cylindrical or ovoid. It blooms in spring and contains 5 petals. Flowers are inconspicuous and have a yellowish-green color. – The fruits are berries that are available in the cluster, formed from flowers. Grains can be ellipsoidal, elongated, spherical or ovoid. Inside, they contain the plant seeds, known as pips.